Granulose dung beetle Onthophagus granulatus, from CSIRO. 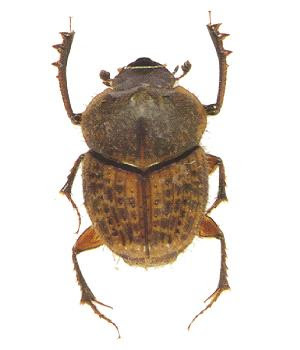 The Onthophagini is a cosmopolitan tribe of dung beetles. Members of the tribe bury pieces of dung for egg-laying where they find it rather than rolling it elsewhere for burial (Philips et al. 2004). Synapomorphies (from Philips et al. 2004): Jugal vein present; MP + CuA narrowly separated; costal margin at wing base with fine striae; proximal transverse bridge of posterior labial struts with distinct lateral surface; lateral margin of cervical sclerites with large rounded lobe; mandible with narrow tooth-like projections on ventral sclerotised area extending towards mandible apex medially; antennal scape with setal row at midline; seventh and eighth antennomeres with small cavity on anterior surface; abdominal spiracle 1 equal in width to or slightly wider than scutellum; prescutum with narrowly transverse projection on anterior, slightly ventrally directed transverse plate; broad notch on lateral edge of scutum-scutellum; mediophragma with posterior dorsoventrally-directed apodeme present; scutellum with apical width 1.5× length; alar ridge of scutellum distinctly converging in dorsal view; pygidium with anterio-medial groove indistinct or faintly visible, extending ~1/2-3/4 length of area between dorsal margin and transverse ridge; transverse ridge on pygidium slightly pronounced; dorsolateral edge of pygidium squared off with flattened edges; pronotal surface with protuberance or one or more cavities present; mid-coxae slightly oblique; body narrowing towards posterior end. [HG01] Harvey, P. H., & C. J. Godfray. 2001. A horn for an eye. Science 291: 1505-1506. [PPS04] Philips, T. K., E. Pretorius & C. H. Scholtz. 2004. A phylogenetic analysis of dung beetles (Scarabaeinae: Scarabaeidae): Unrolling an evolutionary history. Invertebrate Systematics 18: 53-88. [R96] Roff, D. A. 1996. The evolution of threshold traits in animals. Quarterly Review of Biology 71 (1): 3-35.